I always describe myself as a City Mouse. My childhood home was in NJ, 20 miles outside of NYC. My college was in a City in mid-Jersey. and then I lived in Philadelphia, Chicago, San Diego and San Antonio prior to moving to New York City 25 years ago. 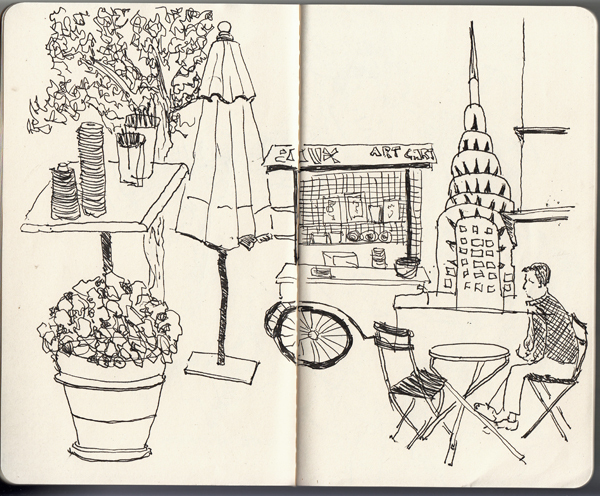 I love drawing in cities, and almost never want to draw a landscape. 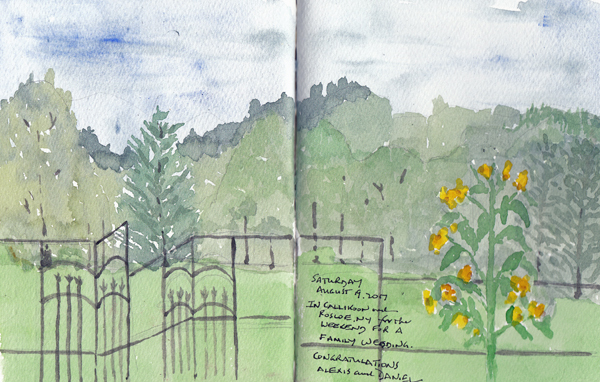 We were at a wedding in NY State, approximately 80 miles north of the City, this past weekend, and I forced myself to paint the view from the back deck of the home we stayed in. 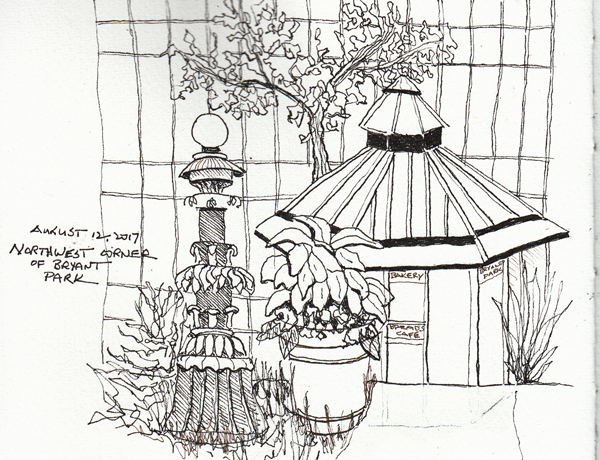 Today I'm posting an ink drawing from the NW corner of Bryant Park, and the landscape that I painted in Callicoon NY. 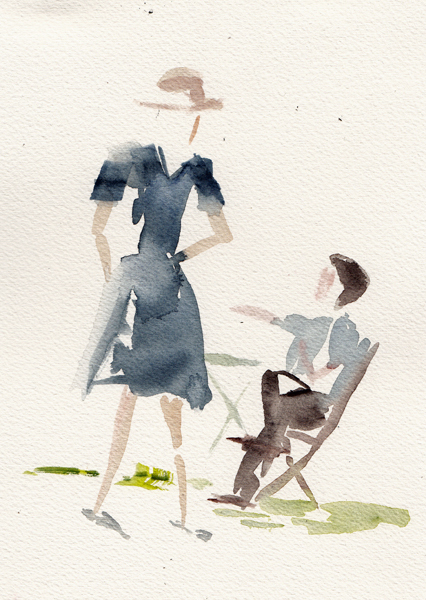 On Wednesday afternoons, from May through October, there are models for outdoor figure drawing in Battery Park City South Cove. Last week Claudia was our model and I especially like her short poses - they are a great challenge. 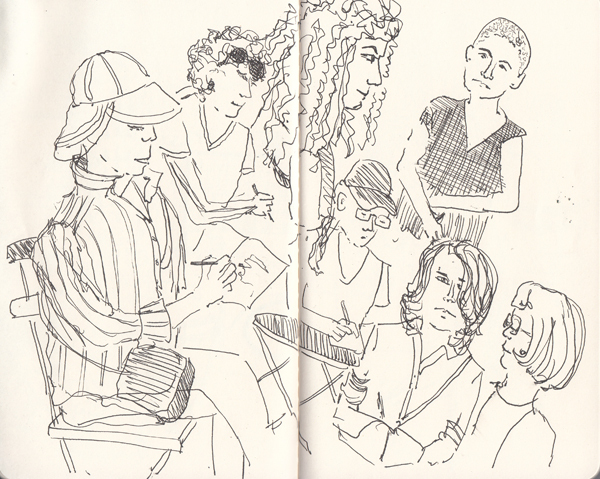 She wore a halter top and jean shorts, and posed in the middle of a circle of the 40+ artists. 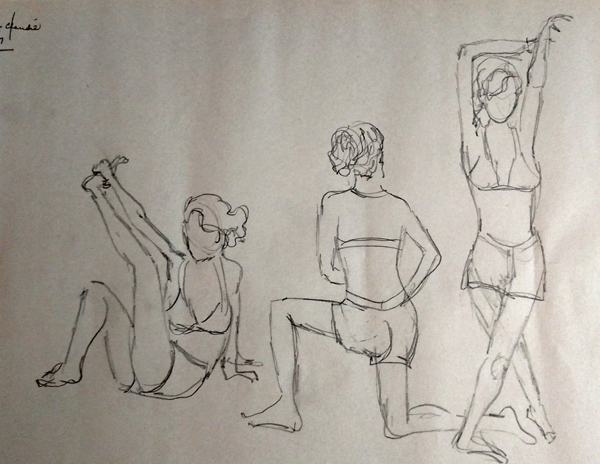 Each of these 2 minute poses were drawn with a 6B graphite pencil on newsprint. 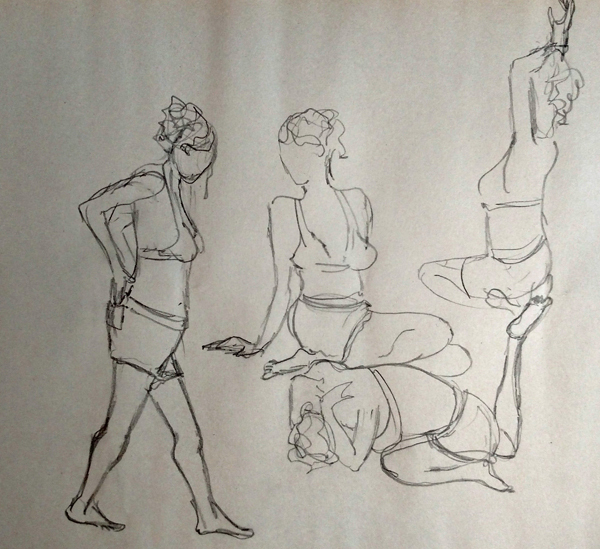 I was pleased with my attempts and decided to post these warm-up poses instead of the ones I did in 5 and 10 minutes. 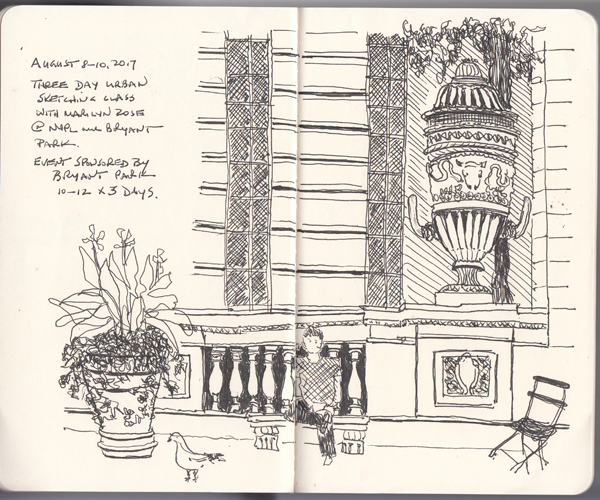 Two of our grandchildren live in Washington DC, and when the oldest was born I started a sketchbook to record daily events when we were visiting her. Pages were created for local places and important activities, and "stuff. "I'm now on volume 2 and here are the two latest pages. 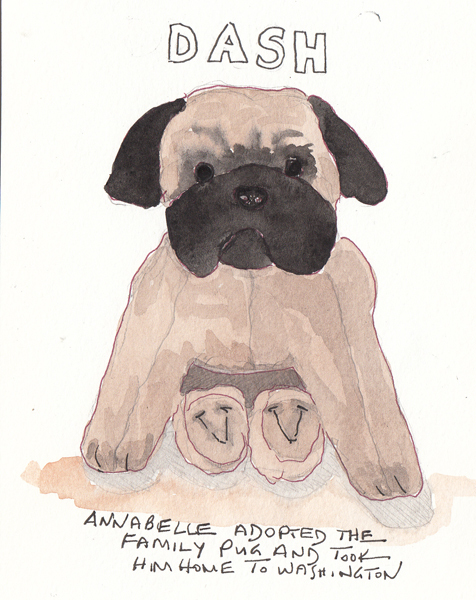 When Annabelle was visiting us in NYC she fell in love with a stuffed animal that was part of the menagerie that accumulated in our apartment when our NYC grandchildren were younger. 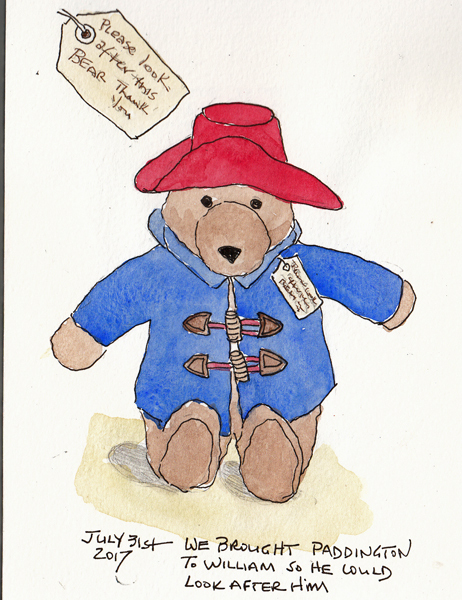 She took the pug, which she named Dash, back to DC, and brought Paddington back for her younger brother. 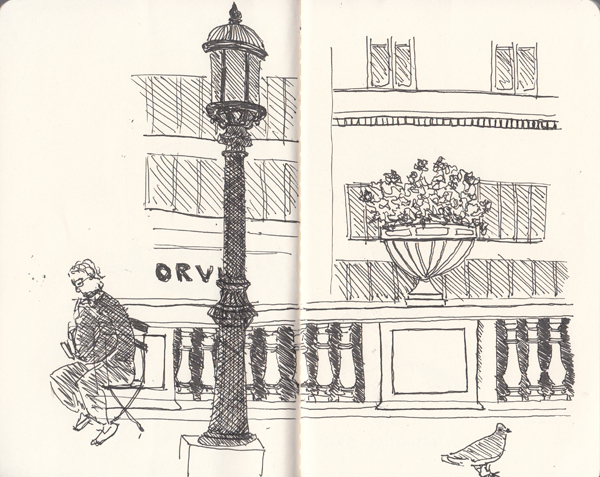 We were there two days and I painted their two newest "lovies" in my DC sketchbook. 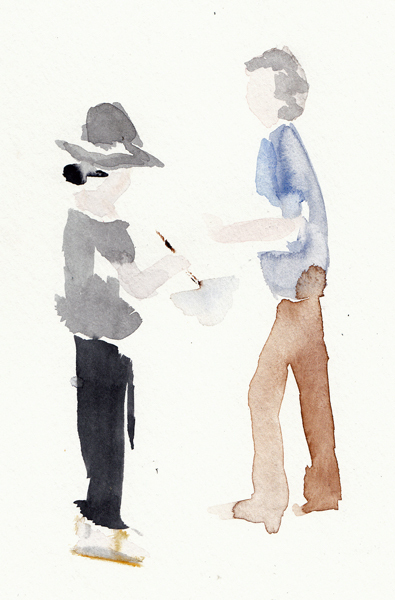 I've admired Anne Watkins impressionistic watercolor figure paintings for almost a decade and was thrilled when her workshop was included in the 10 X 10 NYC Urban Sketchers program. I tend to be a detail oriented person, which was a valuable trait as a physician, but I'd love to be able to loosen up when drawing and painting. The back-to-back classes with Marilyn Rose and Anne Watkins were a perfect combination for last week. We met Anne in Bryant Park - the same location as Marilyn chose, and the park was full of sitting, walking, and ping-pong playing people. 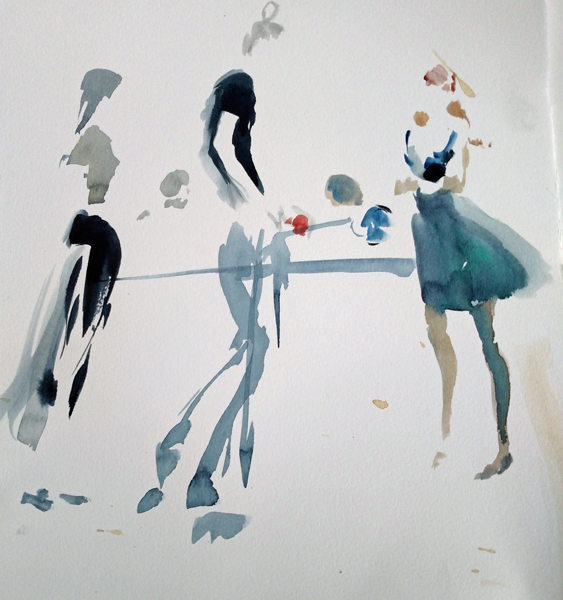 This was Anne's quick demo for us to see how she painted the ping pong players and a link to her website. annewatkins.com/ Look especially at her wedding paintings. 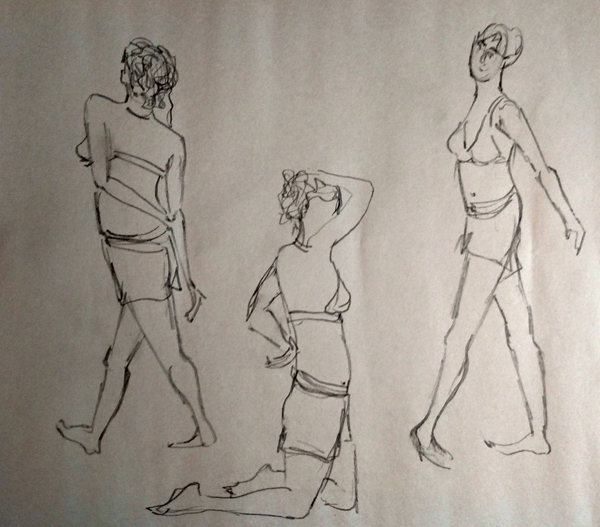 I painted many passing figures during the workshop, and loved the experience. 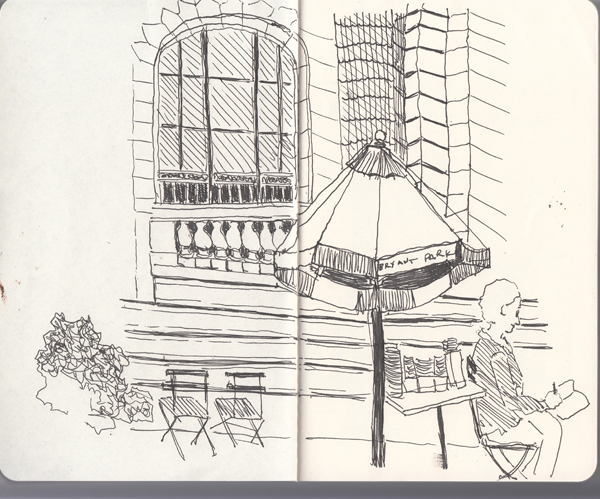 But I will need lots of practice before attaining any mastery of this style. These were the best of the ones I painted.